The Media Girls On Tour event is an effort created by “Blogging Beauties Network”. Media Girls On Tour is a “sister circle” experience for women in media to be able to connect and learn from some of the best of the best in the journalism, blogging, entertainment, PR and television. The second stop kicked off this weekend in Detroit. a.k.a. “Motor City”. Despite the rain, Detroit’s aspiring media talent and entrepreneurs came out to “The D Loft” for Media Girls on Tour Detroit edition. Despite the rain, Detroit’s aspiring media talent and entrepreneurs came out to “The D Loft” for Media Girls on Tour Detroit edition. The venue space was sponsored and transformed by the illustrious design team of Cora Lee Luxe Events. Attendees networked & shopped with businesses such as Ever Butter LLC., Rich Classy Boutique, Sweat, Respect The Queens plus many more, who were represented. Upon arrival, attendees chopped it up, while shopping vendors and enjoying delicious bites provided by Chef Harvin. Signature cocktails were prepared by celebrity bartender, Mary Harvin of UDrinkIMake and sounds by DJ XO. While delectable sweet treats were provided by Kim’s Tasty Treasures and complimentary massages relaxed guests provided by (@sweetest_.touch). This tour stop featured a panel with some of the most brilliant female media talent in Detroit. The panelists included: Youtuber & Brand Influencer, Janae Mason (@Nae2curly), Apryl Lockett (@ask_ap), radio personality at 105.1 The Bounce; Denise Isaac (@deniseisaacwx), Meteorologist; Micalyn Foreman (@miccheck12) pro youtuber, Ash Mac (@ashmacgetsit) Radio personality at Hot 96.3, Melanie Bowers (@therealprguru) Award Winning Publicist, and the event curator, Jelisa Raquel (@thabaddestRHO), media correspondent at Sheen Magazine & creator of Broadcasting Beauty Media. 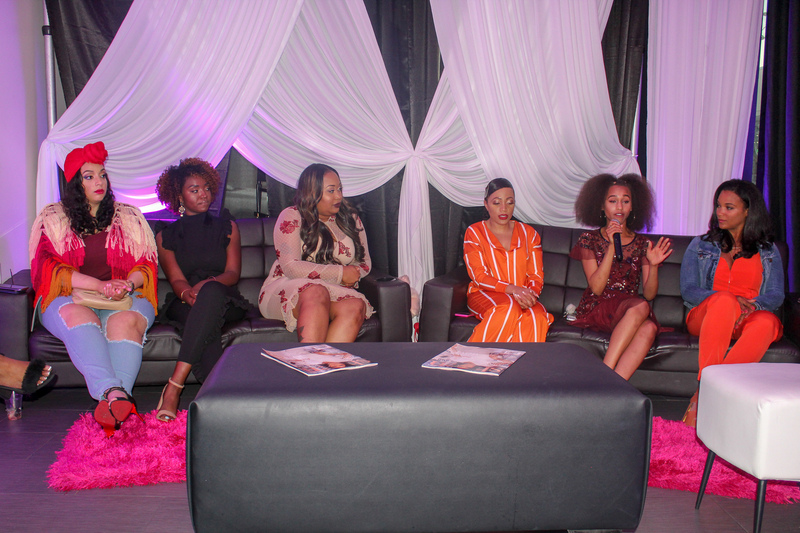 Moderated by Taylor Winter, Galore Magazine Beauty Writer, the panelists candidly shared their experiences on breaking into the industry, how they overcame adversity in the workplace, what they did to build a presence on and offline outside of their jobs. The next leg of the tour is set for July 21st in Chicago, Illinois and will continue to travel throughout the year, making stops in Atlanta, New York, Dallas and LA. Bloggers, publicists, journalists, and correspondents are welcomed to attend. A special thank you to the additional tour partners Rolling Out, Sheen Magazine, Nouveau Riche Consulting and Knotable Designs. Be sure to check back for updates and information about upcoming tour dates and special guests.